· more than half of companies working in the materials and information technology sectors have no women among their board members. In South Africa, the 2014/2015 South African Police Services annual report showed that 43,195 rapes were reported in the year. Parliament hosted a two-day international women’s conference on the 29 and 30 August, under the theme: “Women in the Changing World of Work.” The conference was preceded by the 61st session of the Commission on the Status of Women (CSW61), held at the United Nations (UN) headquarters in March 2017. The theme provided the conference delegates with the opportunity as well as the task to define concrete, practical and action- oriented outcomes, to tackle the structural barriers to gender equality, gender discrimination and violence against women. About 250 delegates attended the conference, including from the Pan African Women’s Organisation, trade union, business and civil society organisations, the African Peer Review Panel and parliaments in Africa as well as from other continents. Parliament's motivation stems not only from the CSW61UN declaration but also because of its legislative role. The Speakers Forum which consists of the Speaker of Parliament and the speakers of the nine provincial legislatures, established a High-Level Panel (HLP) in 2016 led by former President, Mothlanthe. The HLP report will be published in September. However, the findings of this report indicate that the inequality gap has not narrowed as significantly as law-makers have hoped for. The report finds that the reason for this are the triple challenges of poverty, class and race. These continue to remain the key drivers of disempowerment, especially for Africans, women and girls. A hugely critical factor remains the issue around unpaid work that women undertake. This form of labour is immeasurable and largely normalised. It relates to a women’s role as a mother and wife, i.e. care giver duties that go without reward and which often can be used as a discriminatory tool in the work place. 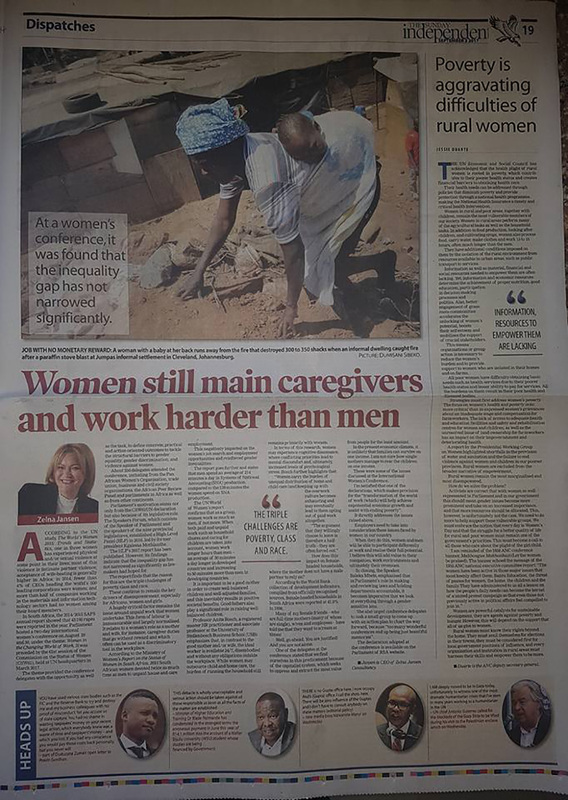 According to the Ministry of Women’s Report on the Status of Women in South Africa, 2015: South African women devoted twice as much time as men to unpaid house and care employment. This negatively impacted the women’s job search and employment opportunities and reinforced gender inequalities. The report goes further and states that men spend an average of 214 minutes a day in Systems of National Accounting (SNA) production, compared to the 129 minutes the women spend on SNA production. The UN World of Women’s report confirms that as a group, women work as much as men, if not more. When both paid and unpaid work such as household chores and caring for children are taken into account, women work longer hours than men, —an average of 30 minutes a day longer in developed countries and increasing to 50 minutes more than men in developing countries. How does this impact female headed households where the mother does not have a male partner to rely on? According to the World Bank collection of development indicators, compiled from officially recognized sources, female headed households in South Africa was reported at 41.9 % in 1998. I have had many of my female friends who are full-time mothers (many of whom are single), wives and employees tell me that they want to scream at times! Well, go ahead you are justified! And you are not alone. One of the delegates at the conference stated that we find ourselves in this predicament because of the capitalist system, which seeks to oppress and extract the most value from people for the least amount. In the present economic climate, it is unlikely for families to survive on one income. I am not sure how single mothers manage to rear the children on one income? These were some of the issues discussed at the International Women’s conference. I’m satisfied that one of the declarations, which makes provision for the “transformation of the world of work will help achieve exponential economic growth and assist with ending poverty”. It directly addresses the issues raised above. Employers need to take into consideration these issues faced by women in our country. When they do this, women and men will be able to participate differently at work and realize their full potential. I believe this will add value to their companies work environment and ultimately their revenues. In closing the Speaker, Honourable Mbete emphasized that in Parliament’s role in making and reviewing laws and holding departments accountable, it becomes an imperative that we look at everything through a gender-sensitive lens. She also urged conference delegates to task a small group to come up with an action plan to chart the way forward as “Too many wonderful conferences end up being just beautiful memories,”. The Declaration adopted at the conference is available on the Parliament of RSA website.